We splurged today and had the Buffet breakfast at the hotel. Omelet, bacon....Yes I do miss American food. The hotel is full of westerners from all countries. What a contrast to our last five days where we hardly saw any. Jet-lag update....Slept until 5:00 this morning! Yeah! After checking out of the hotel, our tour guide and van driver drove us to the boat landing for our cruise down the Li River. We were not expecting the mass of humanity at the boat docks. Boats lined up next to each other 5-6 deep, row after row. At exactly 9:30, they took off down the river one after another. Boats as fas as the eye could see. The boats have a very shallow draft since the depth of the river, especially at this time of the year is so shallow you can see the rocks at the bottom. There is passenger separation on these cruises. Foreign tourists cannot ride on the same boats as Chinese tourists (and we are probably charged more). Lunch (really a dinner for us) is served from a galley on the aft of the boat. Soon after departing the first of the tall karst (limestone) mountains appeared. What an indescribable site. Even though the heat and humidity were high and the haze reduced the Vision of the mountains somewhat, the views were awesome. Every mountain was unique. The top deck was the roof of the boat and provided a 360 degree view. While up there we struck up a conversation with several couples from Germany giving me an opportunity to embarrass myself with my rusty German. Also talked with a couple from Brazil. She had lived and worked in Michigan and Chicago. She apologized for Brazil beating the US so badly in the Women's World Cup held here in China last month. ? 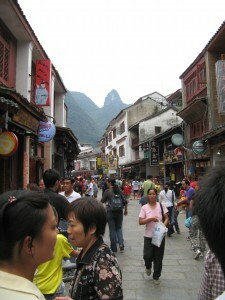 We arrived in Yangshuo about 1:30, exiting almost directly in the main street of shops called West Street. It was a sea of humanity and hustlers, hawkers, touts, call them what you will, Every 10 feet someone is at your side trying to sell you something from Rolex watches (yeah right) to memory cards for your camera, to t-shirts, to ... The list goes on and on. We had to walk to the hotel because drivers can not stop on the busy (and I mean busy) streets to pick up people. 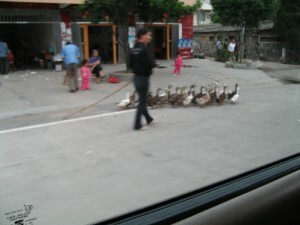 Our driver drove from Guilin to Yangshuo with our suitcases since we couldn't take them on the boats with us. After checking into the hotel I checked for an internet connection and had to go back down to the desk and deposit 100 (about $14 dollars) Yuan to have a man come up and install the hardware for updating this blog. The actual cost is 40 Yuan a day which I considered reasonable, We then went back to West street and window shopped the shops. Carol liked the paintings on silk paper of this area so we went from art store to art store. We ended up back at the first shop and started the bargaining process. I decided my best tactic would be to determine a price for one and then see what we could do for three. The price started at 90 Yuan I responded with 30. She countered with 80, I said 30, she said 50....i said ...you see where this is going....She went to 40 and we walked out the door and she came down to 35. I pointed to another store down the street and her old man said 30. We went back in and I said how much for two more and he said 90...I said 80 and he said his cost was 30 each....yeah right....but he wouldn't budge and I'm getting tired. My cousin's wife said to throw in three boxes and we would pay 90. He said OK and we had a deal. Memories of our other life in Turkey without the tea. We look forward to hanging these art work paintings behind the piano. It was now time to get back to the hotel and then a nearby restaurant for dinner. 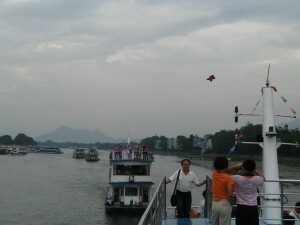 Then change to long pants (mosquitoes) and attendance at a Light and Performance show that takes place on the Li River. With Li River providing the state and the karst mountains providing a grand scenery backdrop to the show, it was an impressive performance. The show has over 600 performers out on the water in bamboo rafts or floating platforms with colorful illumination. There were about 1400 in the audience and they put on two more shows after ours and they do this every night. Many of the performers are local residents and have day jobs as well. That about wraps up this day. 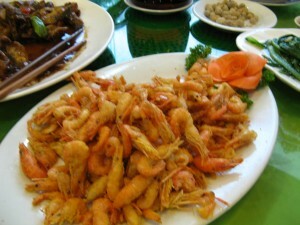 Food of the day pictures was a river fish and river shrimp. Li Jiang (Li River) A boat cruise from Guilin to Yangshuo along 83km (52-mile) stretch between the two towns affords some of the country's most breathtaking scenery as the river snakes gracefully through tall karst mountains, gigantic bamboo sprays, and picturesque villages -- sights that have inspired countless poets and painters for generations. 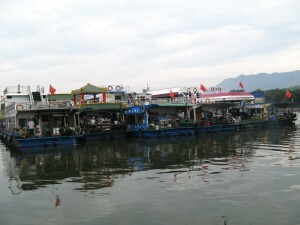 Currently, river trips depart from Zhu Jiang Matou (Zhu Jiang Pier) 24km (15 miles) and a half-hour bus ride south of Guilin at around 8:30am. The first 1 1/2 hours of the cruise to the town of Yangdi is serene and comparatively unexciting but for names of hills along the way, such as a woman yearning for her husband's return, the Eight Immortal s, even a calligraphy brush. Visual highlights are clustered between Yangdi and the picturesque town of Xingping. Jiuma Hua Shan (Nine Horses Fresco Hill) is a steep cliff face with shadings and markings said to resemble a fresco of nine horses. A little farther on, Huangbu Daoying, a series of karst peaks and their reflections, is the tableau burnished on the back of a Chinese ¥20 note. 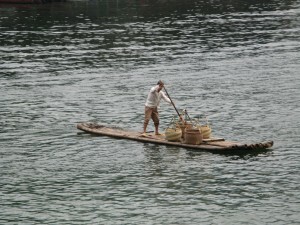 Boats arrive in Yangshuo in the early afternoon after 4 or 5 hours of sailing. 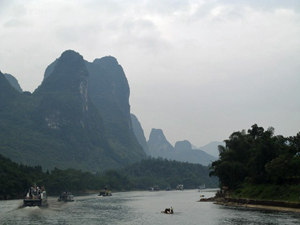 Introduction to Yangshuo Guangxi Province, 65km (40 miles) S of Guilin Located at the terminus of the Li River cruise from Guilin, the small town of Yangshuo has long been a mecca for backpackers, but long before that, it was a geomancer's delight too. Here the vast landscape is reduced to a garden scale, nature in microcosm, where hills, mountains, oceans, and rivers are reduced to rocks, karsts, streams, and pools. 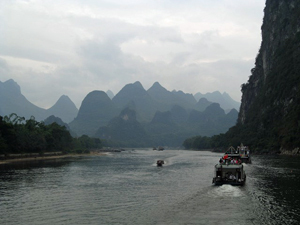 Set amid an awesome cluster of limestone pinnacles -- a zigzag, serrate d skyline superior even to that of Manhattan -- Yangshuo is more beautiful, less expensive, and significantly less crowded than Guilin. Some of the most impressive karst scenery in Guangxi can be found just a short bike ride outside town. With its inexpensive hostels and Western-style cafes, some foreigners have been known to stay for months, sometimes even years. Once a sleepy little town, today's Yangshuo is being overtaken by upscale hotels, new shops and bazaars, and hordes of eager tourists. Perhaps it is no longer the unknown, quiet idyll of years past, but it remains a lovely and relaxing place to break a journey and to soak up some of China's most beautiful scenery. Xi Jie (West Street), with its souvenir shops and travelers' cafes, has become a bona-fide tourist attraction for Chinese visitors, who completely take over the street starting in the early afternoon when boats from Guilin pull in. The former Ming dynasty Jiangxi Huiguan, once the guild hall for merchants from Jiangxi Province, has now become part of the Hongfu Hotel on Xi Jie, but it's worth a quick pop-in for its finely carved lattice doors and windows. In the southeastern part of town along the western banks of the Li River, the Shanshui Yuan park (¥21/$3; open 8:30am-6pm) is home to the impressive karst mountain Bilian Feng (Green Lotus Peak), which towers over the town and the harbor. In the western part of town next to the bus station, Yangshuo Gongyuan (Yangshuo Park) (Diecui Lu 22; ¥9/$1.10; open 6:30am-7pm) sees few foreign visitors but is full of loafing locals who pay nothing to enter. You can hike to the top of Xilang Shan for some arresting views of the countryside. Li Jiang (river) After Dark: Every night 2,000 spectators fill the purpose-built riverside amphitheater for acclaimed director Zhang Yimou's waterborne spectacular, "Impression, Sanjie Liu." This innovative new show is on a grand scale with over 200 bamboo rafts in the water at once and a total production crew of some 600. It is a strange but beautiful mix of floodlights, singing, and minority processions against a magical backdrop. Tickets start at ¥200 ($28) and can be arranged through most hotels. The show starts at 7:45pm but best to get there half-hour early, leaving time to wander Liu San Jie Park. Seats are reserved.